The budget delivered in Wellington last week contained no major surprises for aid. We’ve had a National Party government for nearly six years, and those years have already proven lean ones for aid. This year’s budget does not change that. 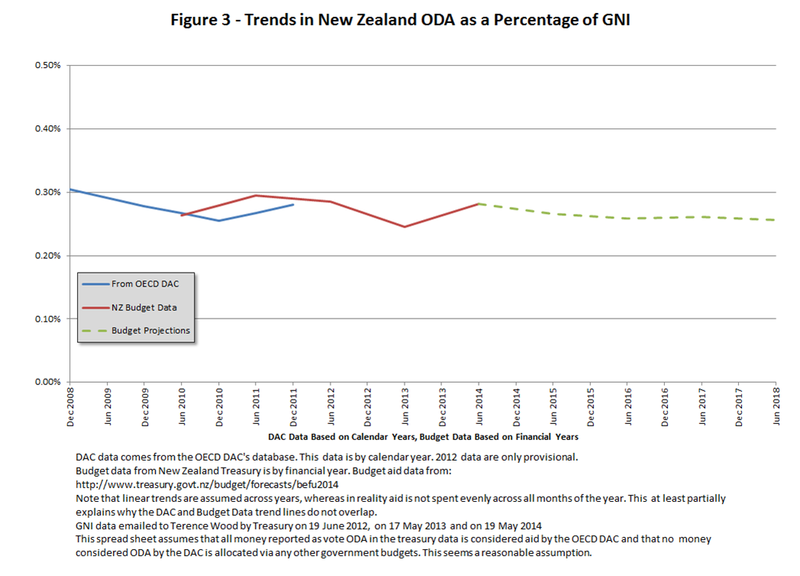 As it is budgeted, New Zealand’s aid spend for the coming financial year is effectively identical to this year’s. Although starting July 2015 (which is the first year of a new three year spending tranche) aid is – as Figure 1 below shows – forecast to rise in nominal terms. However, as Figure 2 below shows, once inflation is taken into account, even this increase is very small. And as a ratio of GNI we actually see a slight decline before stagnation at around 0.26% of GNI. To make matters worse, a significant slice of the money that will fund the nominal aid increase from 2015 appears merely to be old, unspent aid money being recycled. 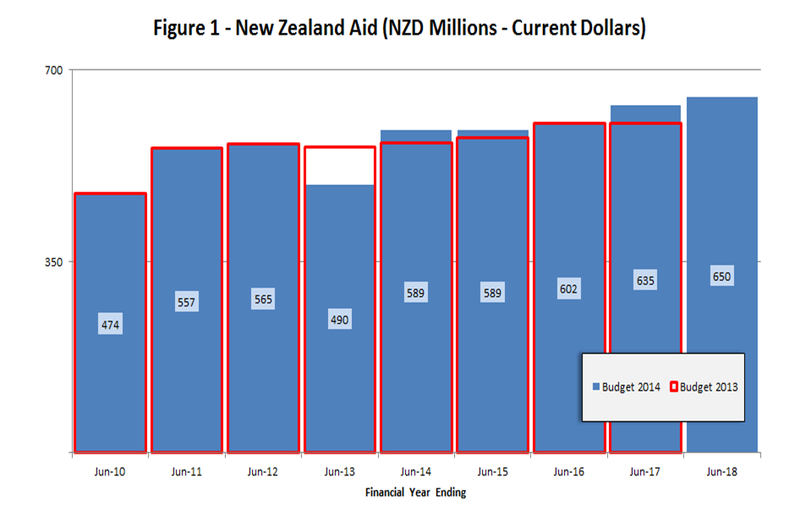 At the end of the 2012/13 financial year, the aid programme, presumably struggling to find large, viable, ‘transformational’ projects as per the Minister’s diktat, came in nearly $NZ 75 million underspent (witness the difference between projected spends in the budget for the financial year ending 2013 shown in red in Figure 1 and what was actually spent shown in the blue bars in Figure 1). And this money – as best we can translate the vote ODA budget document – will be rolled forwards into the next three year spending tranche, providing a major chunk of the nominal boost to our aid spending moving ahead. Rolled forwards is better than lost. But there is no danger of New Zealand being mistaken for a generous aid donor any time soon. A version of this email appeared on the Devpolicy blog. We are very grateful to Tim Helm for his help with budget analysis. 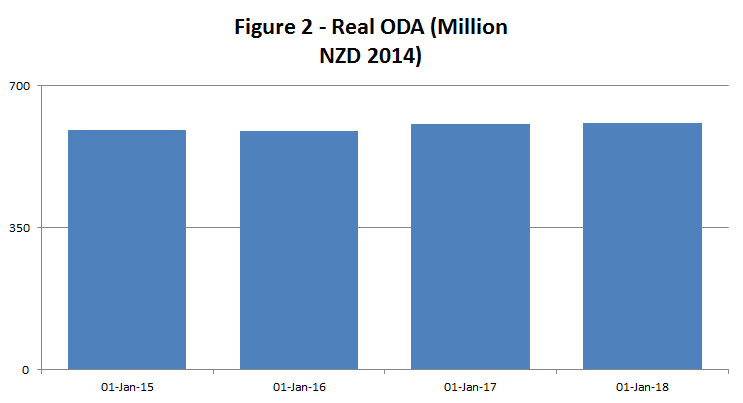 New Zealand’s Council for International for international Development has put out a strong statement pointing out just how little we give as ODA and calling on New Zealand to give more. Read it here. Over the Tasman Devpolicy has three excellent pieces of analysis on Australia’s aid budget here, here and here. And the Australian Council for International Development has it’s analysis here.